Motorists passing through Miles in the Western Downs will soon notice safer road conditions, with a major upgrade of the Warrego Highway set to begin early next year. The jointly funded Miles Western Upgrade project, part of the Warrego Highway Upgrade Program (WHUP), will also boost freight transport time from the agriculture and resource rich Western Downs region to other parts of the country. Federal Minister for Infrastructure and Transport Darren Chester said up to $8.24 million in Federal funding had been formally approved for the project. “This is one of 15 projects being delivered as part of the Warrego Highway Upgrade Program (WHUP) between Toowoomba and Miles, which the Australian Government is delivering in partnership with the Queensland Government,” Mr Chester said. Acting Queensland Minister for Main Roads, Road Safety and Ports Steven Miles said the Miles Western Access Upgrade would create safer intersections, reducing the risk of crashes by making turning movements safer. “The Queensland Government is proud to be contributing $2.06 million for this vital project in a region that has experienced significant economic development in recent times,” Mr Miles said. 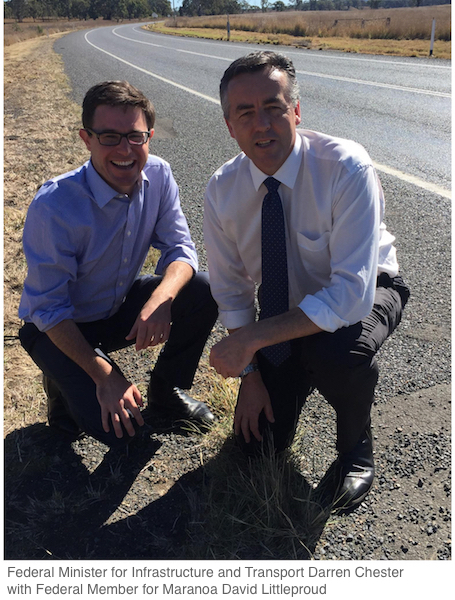 Federal Member for Maranoa David Littleproud said works would focus on upgrading intersections, improving safety for pedestrians and vehicles travelling through the western section of Miles. “Five sites have been identified for road safety improvements and will include highway widening, strengthening and resurfacing,” Mr Littleproud said. The Miles Western Access upgrade is a jointly funded project, with the Australian Government committing up to $8.24 million and the Queensland Government $2.06 million.